A tasting a Long Meadow Ranch is essentially a journey, not a stop-and-sip situation. Plan your experience and make your reservations well in advance because they don’t accommodate very many visitors per day. Our journey began at Farmstead, a restaurant on Highway 29 in Saint Helena that’s owned and operated by the team at Long Meadow Ranch. They farm their own meat and produce for diners there and even run a local farmer’s market on site. We parked our car and made our way to the outdoor coffee bar that sits adjacent to Farmstead. We sat in a waiting area, not exactly sure who we would be meeting or where that would be. Turns out it would have been better if we went straight to the barista and made ourselves known. Learn from our mistake. Our guide was friendly and personable, and he was accompanied by an equally sociable driver. Yes, this journey involves a chauffeured trip up the mountainside to the winery’s location. The tour bus sits around twelve people so your entire party can travel together. It’s a quick trip, between five and ten minutes long. 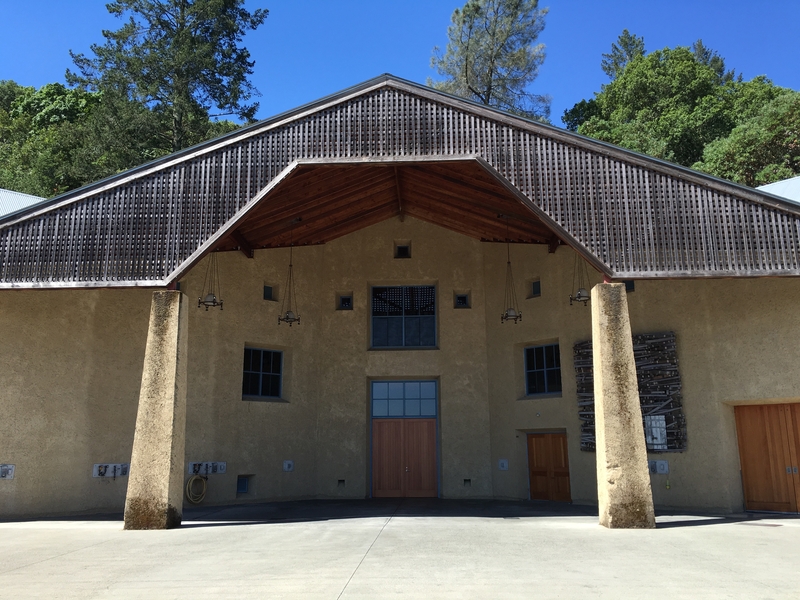 Long Meadow Ranch Winery sits halfway up the Mayacamas Mountains, behind Whitehall Lane. 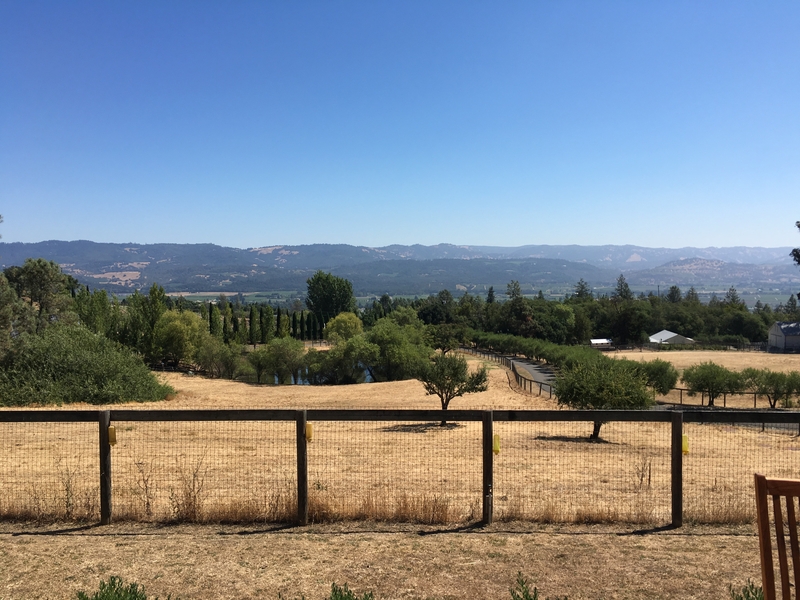 The journey up the mountain features native shrubbery and grasses that populate Northern California and highlights a rural experience, which we love, compared to the commercialization of the valley floor. The views at 800 feet are splendid, with no traffic noise interruptions, and the rammed earth winery is unique, to say the least. The tour started outside on the patio with a delightfully refreshing 2014 Rutherford Estate Sauvignon Blanc. It was a favorite of the day with crisp floral notes and ribbons of apricot and nectarine. We continued the tour inside the tasting room and sat at a single bar with a small charcuterie board featuring their delicious agricultural fare. 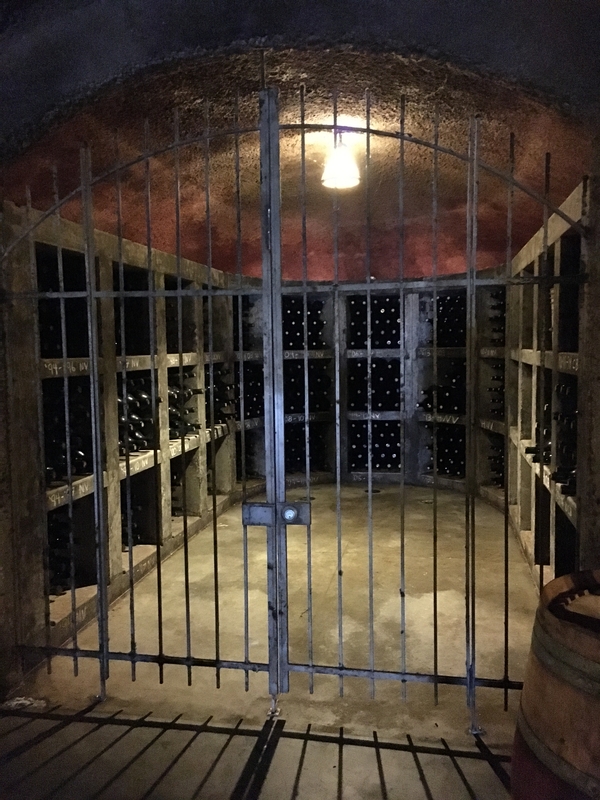 We enjoyed the 2013 Rutherford Estate Merlot that displayed rich tannins, tart wildflowers, and the unmistakable influence of strawberry patches that grow near the vineyard. 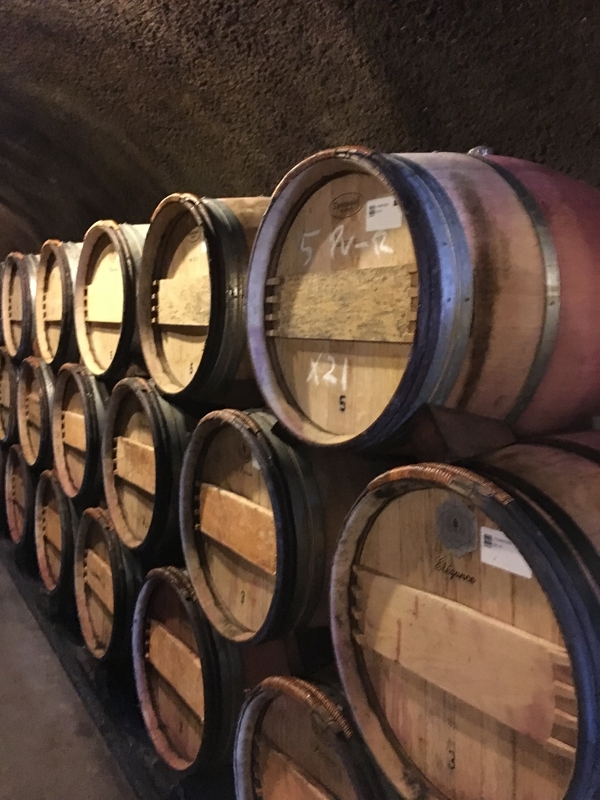 The 2012 Mayacamas Estate Merlot was another hit with us. Its black fruit and dark, dark chocolate finish were truly special, making it the cab lover’s merlot. Inside the cave we were treated to a 2004 Napa Valley Cabernet Sauvignon. The bottles were unmarked and lay forgotten in one of the cellars. Their accidental discovery was certainly our gain. It shows amazing red, jammy fruit and virtually no tannins to speak of. Finally, we sampled the 2013 E.J. Church Napa Valley Cabernet Sauvignon. It featured deep raspberry, and notes of blackberry and plum. The olives on the nose are a nod to the olive grove that was planted on the property in the late 1800s. In addition to the tasting room and cave we were taken to the tank room and were given a tour of the press that’s used to make olive oil. It was quite the contraption. 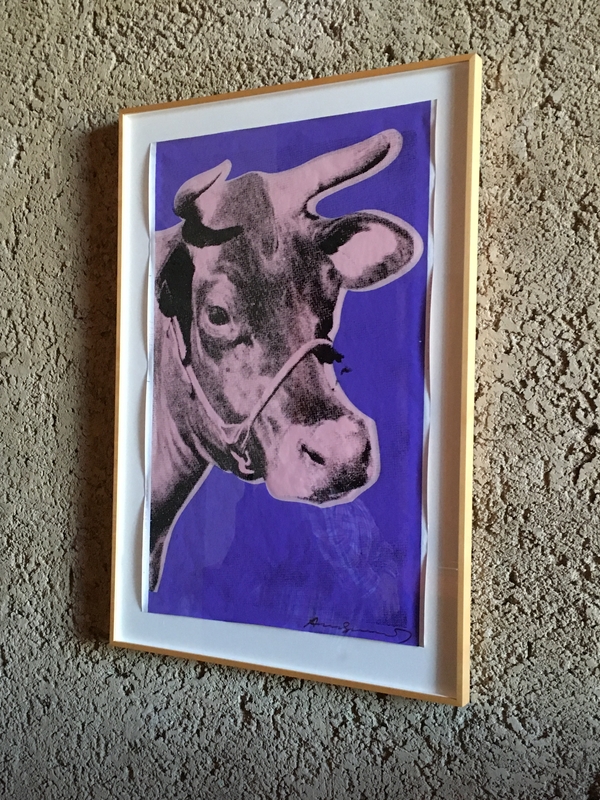 We especially appreciated the artwork on display which included original Andy Warhols. Our guide shared that there are several more displayed around the winery that employees enjoy on a daily basis. Tip: A new winery in Rutherford is planned for fall 2018, so we’re not sure how long these trips up the mountainside will be conducted. If you’d like a tour, don’t delay!